“Under the Waves” by photographer Christopher Markisz. 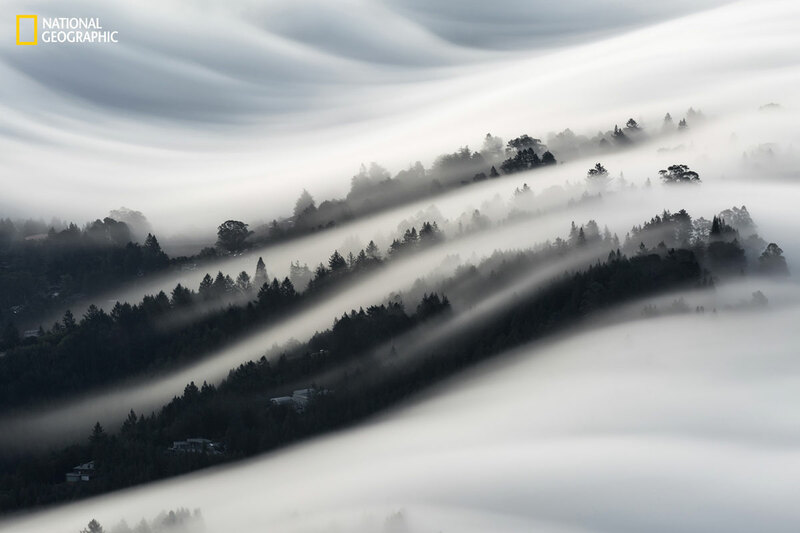 Waves of fog roll over a neighborhood in Mill Valley, California, as seen from the top of Mount Tamaulipas. The photo is one of hundreds of entries in National Geographic’s 2016 Nature Photographer of the Year competition. The deadline for entries is November 4. This happens to be one of my favorites but you can browse all the entries in this year’s competition on the NatGeo website and “like” your favorites if you wish. Photos under the “wallpapers” tab are downloadable as wallpaper for your computer, tablet, or phone. I can see why it’s a favourite; stunning photo. Another example of a photograph that my eyes keep telling me is a painting, or in this case, maybe a black-and-white illustration. I’d probably have a better chance with a camera than with paints (or a computer). But that would still require being there at exactly the right time. Hi, Chris. This is a really fascinating photo. I keep saying “photo” but my eyes keep saying “painting.” I’ve always loved fog but rarely see it where I’ve lived (mostly the plains). And I’ve never seen it flowing over the hills like this.